Flexible sanders with new angled end. Available in handy 1/2 x 6" sizes. Includes: one each of coarse, medium, fine, x-fine and triple-grit polisher. Flex-Pads put a “New Angle” on modeling with improved versatility and convenience! Made of flexible polyester abrasives and containing inner padded support the Flex-Pad provides evenly distributed pressure over irregular surfaces without digging in or scratching. Triple-Grit Polisher/Finisher cleans and polishes in 3 easy steps. 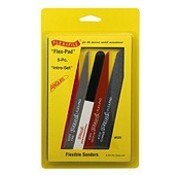 All products contained within this kit work well on plastic, wood, metal, and painted surfaces.